Casey Cox is still on the run trying to prove her innocence of the murder of her friend Brent. Dylan has been hired by Brent's parents to find Casey and bring her to justice. The media is confused by Casey's behavior. Told that Casey is a cold-blooded murderer, yet her actions in helping rescue a woman held captive, tell a different story. Once again Casey has had to change her identity and move on, and once again she gets mixed up into someone else's troubles and must at all costs help them even if it means being found by the men who framed her for murder. Can Dylan find Casey before these men? And can he find enough evidence against them before they kill Casey? If I'm Found starts right where If I Run ends. There is a lot of action and a lot of emotions in this book. There are really two stories being told in this book. Of course the main story is Casey trying to prove her innocence and trying to stay alive long enough to do it and then the story of the people that Casey helps is woven into Casey's life. That story isn't pretty at all. I definitely had a hard time reading parts of that. The author has a way of presenting the evils of human behavior that cause the reader to be aware of things that happen outside of our every day bubble of security and contentment. Not only does she show us the evil that humans are capable of, she also shows us the need for a Savior to cleanse us of that evil. The clear message of salvation is definitely one of the things I especially appreciate in this authors writing. 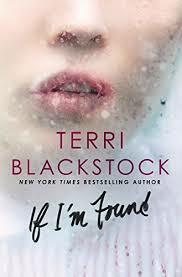 At the end of If I'm Found we are left with closure for the secondary story and a cliff-hanger in Casey's life. I can't wait for the next book in the series!